The idea came to me so vividly. We would soon be traveling to Houston for the International Quilt Festival to set up a booth and share The Sewing Machine Project. Houston. And every sewing machine brand would be at the Festival as well. Houston. Altogether, these three generous companies donated 110 sewing machines. They’d be waiting in Houston. I looked at a map, I made some calls, I located community centers in hard hit areas–areas where most residents were still in shelters–areas where residents would be struggling so much. And bonus, the community centers offered sewing lessons, quilting groups, so I knew there were sewers. 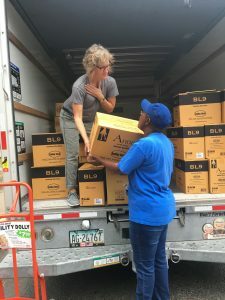 On Tuesday October 31st, I, along with my friend and board member, Kim, rented a 15′ UHaul truck and picked up 110 sewing machines. 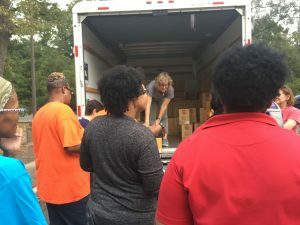 Every step of the way, whether loading machines off the loading dock, finding someone with a pallet jack in a cavernous conference hall, unsticking a stuck door on the UHaul, every step there was someone there to help us. An angel. A bodhisattva. At 4:45 we arrived at the first community center, greeted by ladies who had been waiting since 2:00. We talked, we hugged, we laughed, we cried, we listened to stories of loss. We handed out machines. 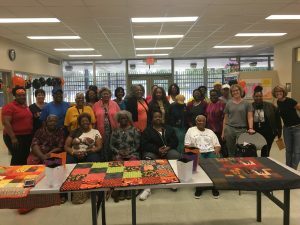 And in that moment, in that magic moment, we all were bound together by this understanding that sewing heals and a sewing machine can make a difference. Our deepest gratitude to Bernina, to Babylock, to AllBrands for their compassion and generosity. What a WONDERFUL article! I just found your website when looking for feet for my ancient Kenmore machine. Your generosity of idea, then plan, then action to get sewing machines to people who so needed them and could start to take their lives back was absolutely inspirational. I can only imagine what a boost it gave to the individuals, the families, and the communities to whom you extended such compassion, effort and generosity! As a fellow human, thank you very much!